First Line: Summer in Benteen County, Kansas, is a season possessed of all the gentle subtlety of an act of war. 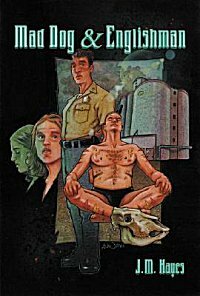 When Sheriff English's part-Cheyenne brother, Mad Dog, arrives in the park to meditate, he finds the mutilated body of Reverend Peter Sims, and the entire county is set on its ear. Benteen County is sparsely populated. Everyone knows everyone else's business. Sheriff English has never had to investigate a homicide, even the coroner (who's been on the job for over seventeen years) has never had to deal with a murder victim. So it's important that they do everything right. Since Mad Dog is the natural prime suspect, Sheriff English has to not only look for suspicious characters, he has to delve into the history of the Simms family, which is very dark indeed. More murders seem almost inevitable-- just like that tornado that's on the horizon. Hayes brings small town Kansas to life and doesn't put a foot wrong with his cast of characters. Sheriff English's ex-wife is a teacher, and they have a mouthy teenage daughter. Although they're divorced, they can't seem to keep their hands off each other-- which is something the entire town knows. There's also the incompetent police officer who got his job through nepotism. He can't use his handcuffs because his kid lost the key and he hasn't got the replacement yet. The dispatcher is good at her job, but she's also Gossip Central. The guy who lives behind the police station keeps planting roses in the parking lot and then has fits when the police run over them. Anyone who's ever lived in a small town recognizes these folks. The identity of the killer and the reason behind the murders were a bit obvious to me, but that didn't matter so much because I truly enjoyed getting to know this corner of Kansas and the entire cast of characters. This first book has set me up perfectly, and I can't wait to continue with the series. I like the first line you quoted. Sounds like Illinois. Remember those awful Illinois summers? I never understood why they had the state fair in August when everything in the state is wilting in the heat. Barbara-- Those awful Illinois summers back in the day when scarcely anyone had AC? Yeah. I'd get my chores done early and spend the next 12 hours in the pool. As for the state fair, I remember some hair-raising rides through country roads late at night coming home from the fair.